We’re building sites not just to entertain people, but also to let them buy or do something. A site needs a great user experience to get people to use it. Increasingly, we see that UX is an integral part of the SEO process, not to mention conversion. So in this regard, we can all agree that a homepage needs a great call to action (CTA). Now that you have a visitor clicking that main button or link on your homepage, you should think of what happens next. The visitor lands on a second page. One of your goals is met; you prevented a bounce. 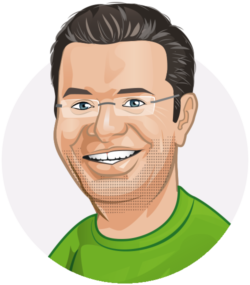 Now you need to convert that visitor into a customer or subscriber. Although a call-to-action is very important on a homepage, of course there could, or perhaps should, be a CTA on every page of your website. The contact form has a call-to-action, of course. A quote form in the sidebar has a CTA. Buttons for your own products, like in our sidebar, have or even are call-to-actions. For every page on your website, you should decide if there is a CTA related to the content of that page, or that the content is solely for informational purposes and that call-to-action should be to achieve something else. This should be the obvious one. Every product page needs an ‘Add to Cart’ or ‘Buy Now’ call-to-action. That button, as in most cases this is a button, needs to stand out, is usually accompanied by an ‘amount’ select box and is present in all shops. Otherwise, the shop is merely a catalog. I am sure you can come up with more clutter like this. Don’t get me wrong: these items should be available, I just highly doubt they need to take the focus away from the ‘Add to Cart’ button. Just make them a lot smaller than the call to action and locate them a bit further away from that button. The image above is an extreme example of a designer trying a minimal approach. One of the main reasons I dislike it is because I had to scroll to see the ‘Add to shopping bag’ button. I would create a block with all the options, but choose the right form elements to reduce clutter, keep the form options short and compact and focus on the important stuff. 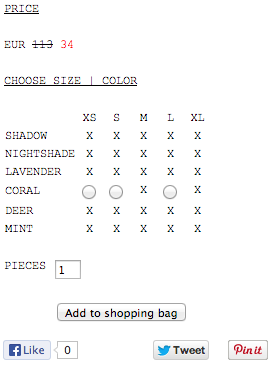 A select list for color, a select list for size, some code logic to make sure only available stock is shown. I think that would be my main show stopper, by the way. Seeing the product I want, clicking to a product page and landing on a page that says ‘Out of stock’ instead of ‘Order now’. At least give me some alternatives, but rather tell me when it will be available again (approximately) and maybe even give me an option to reserve the item. Read more about eCommerce usability and UX in our ultimate guide. There are quite some sites out there that have a form in a sidebar to ‘Request a quick quote’, or ‘Quick contact’, like the one on the right. Now slap me silly and call me Susan, but if I have to fill in all these fields, that is not a quick contact to me. Let’s be honest, what do you need to know? Email and name, perhaps? Just ask that. Now, I recently had a discussion with someone who shed a different light on this. The guy in question pointed out that the form was intentionally a bit longer to filter the entries. In his opinion, people that were willing to fill in the extra fields were more likely to become serious customers. If there are just a few fields, it’s too easy to fill in the form and hit ‘Send’. This is, of course, a matter of quality over quantity. And it is related to the product or service at hand as well, but he certainly had a good point here. It does not imply the form on the right is the form I would prefer. Why split up first and last name? Why ask email address and telephone number? Even a form that asks for more details can be more focussed than this. Besides that, the Send button is also a not really appealing. ‘Send’ feels just a lot less right than ‘Please contact me!’. That will also enlarge the button to make it stand out more. First of all, you need to be sure you’re using an active voice. An active voice is action-oriented, and so literally calls people to action. And that’s exactly what you want. Make people want to click your button! Make sure your button text is specific to what people are doing. ‘Send’ is just too generic. Use something like “Sign up!” for a newsletter, or “Contact us” for a contact form. The text has to explain what the button will do. Use small and simple words. You need to keep your button text as simple as possible. People have to understand what it means immediately. Lastly, creating urgency can convince people to click your call-to-action. You can do this by, for instance, having limited time offers or by telling people how your product can help them or solve their problems now. This can even be a text next to your call-to-action. But just like Frank Luntz put on the cover of his book Words That Work: “It’s not what you say, it’s what people hear.” So you definitely need to test whether all these tips will actually work for you. There’s no guarantee that what has worked for us, or any other company, will work for you. a local number might stimulate local buyers to buy at your place. Regarding that last one, Peninsula Air Conditioning told us that the general 1300 number did not emphasize enough that it is a local business and customers had told him that. Changing to the local number, created recognition and increased trust in the website. Of course, they created a secondary, textual call-to-action right below the local number, to assure visitors from other cities than Sydney, that the company could still help with their air conditioning needs. It’s a nice example that the CTA on your contact page does not always need to be something you can click. The last example I would like to mention in this post is the Subscribe to Newsletter option. Again, you only need an email address for that. Even if you would want more details, you can always ask for these later. 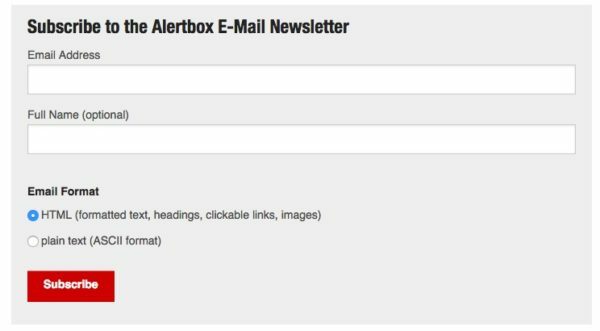 The subscribe to newsletter call-to-action can be on every page, below every post or after every check out page. The main difference between the contact or quote form mentioned above is that it is a lot less clear what the consequences are. It’s quite clear that filling out a contact form leads to the company contacting you. The newsletter subscription might result in an email a day or once per fortnight. It might be an email listing just excerpts of posts on a website, or it might be something ‘extra’ for subscribers. Being clear on what’s going to happen after subscribing, reduces the barriers to trust you with my email address. Making clear that you will not send any spammy emails also helps a great deal, for obvious reasons. Enlighten me with your thoughts on this in the comments below. I’d love to see some examples of great call-to-actions as well, but please please me with designs gone wrong. There are plenty of those out there! A good informative article on call to action, really amazing, thanks for sharing this. It seems like the starting point with this is to decide on a CTA that is extremely compelling. Visitors seem less willing to give up their email address, so just having a CTA on your site is no longer enough. You also need to have an offer that really compels people to act. Hi Allen, definitely! That’s the first step of course. Very useful guide on call to action. I have multiple call-to-action on my website but i can make improve it more after going thru this post. Very good article. I got a ah-ah moment recently regarding Call-To-Action in blog posts. I was finding myself writing over and over the same call-to-actions at the end of all my posts. After few posts, I found that it was dumb to do it that way. What if, at some point, I want to change those call-to-actions? There is no way that I’ll go back through all my posts to change a bazillion times the same call-to-action text. So the solution that I have found to that problem is to embed my call to actions into the author box that is printed at the bottom of every posts. It is fabulous that way. If I need to tweak or change them, there is only place to do it. This is a good stuff when it comes to discussing UX and the CTA. Appreciated for providing more information on the points mentioned and all the best in your online journey. I enjoyed your article and thanks for sharing this. Thank you so much for sharing site structure step by step guide. It will help me a lot and I can easily structure my site. What might the call to action be for a site like mine that provides news stories? Maybe: read more stories?